Preston Mack sets up the Gigapan EPIC Pro at the Opening Night for MLB at Minute Maid Park in Houston! 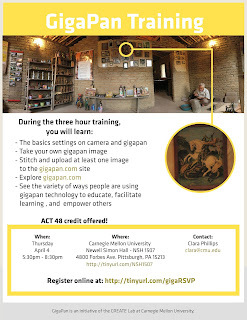 Join us for our monthly Gigapan Training Session on Thursday April 4, 2013 from 5:30pm – 8:30pm. Please RSVP by: April 2, 2013. We run this class once a month so if you cannot make to this one, please sign up for our mailing list HERE to stay posted on the next scheduled class. Expectations Share your knowledge with others and create meaningful snapshots. CREATE Lab also holds on-site training for team of educators. If you are interested please contact us at clara@cmu.edu. Photographer David Bergman joined the B&H Photo and Video team for an interview and review of the Gigapan EPIC Pro. NASA Jet Propulsion Laboratory uploaded their latest image on gigapan.com, a mosaic of images from the Mast Camera (Mastcam) on NASA’s Mars rover Curiosity. It highlights Mount Sharp in a white-balanced color adjustment that makes the sky look overly blue but shows the terrain as if under Earth-like lightning.